BiDiB is een nieuw protocol dat P&P ondersteunt op een hoog betrouwbaarheids nivo. Leest CV waarden on the main van Railcom loc decoders . Loc besturing, snelheid, functies …..
IID for addressing this interface directly from without Rocrail. Device name of the RS232 port. Typically COM1, COM2, COM? for Windows, and /dev/ttyS0. /dev/ttyS1, /dev/ttyUSB0 for Linux based systems. Communication speed in Bits Per Second. 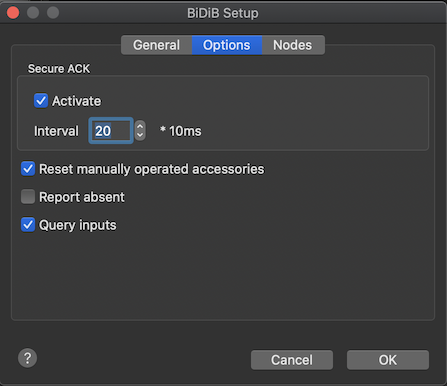 To enable the secure ACK option of the BiDiB protocol. If Rocrail did not send an ACK with in this time frame the event will be resend by the sensor unit. 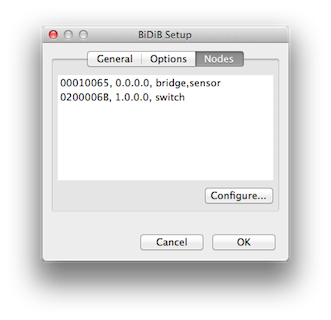 This node overview list will be automatically generated during the connection setup between Rocrail and the BiDiB interface. 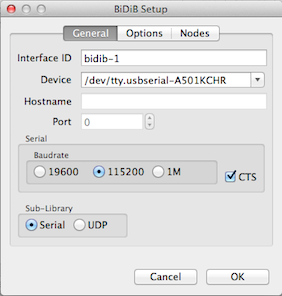 Read the Configuration page for more information on node configuration.